Although better known for its motorcycles in the U.S., globally, Suzuki automobiles outsell Subaru, Mazda, and Porsche combined, and in many years, Suzuki is the best-selling auto manufacturer in Japan. Here in the States, the company is trying to get onto the radar of mid-sized car buyers, and its latest release, the 2010 Suzuki Kizashi sports sedan, might do that. 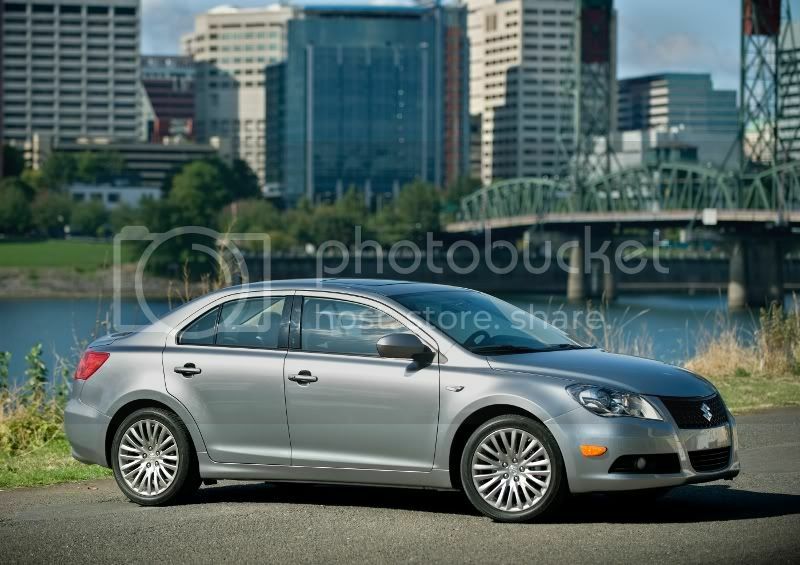 Already a 2010 North American Car of the Year nominee, the Kizashi should be on many people's shopping lists, especially here in Portland, OR. Why? Because it will be available with all-wheel drive—something many Portland residents have found to be a desirable amenity. With our rain-slicked streets, nearby snow-covered mountains, and abundance of twisty roads, Portland is a hotspot for all-wheel drive vehicles. So it's fitting that Suzuki chose Portland as the site of the vehicle's west coast launch. I was invited to drive the vehicle at Portland International Raceway. Let's take a look. If you took the Suzuki badges off of the car, brought it down to Pioneer Courthouse Square, and asked people what kind of car they thought it was, I'd bet no one would guess it was Suzuki. Although not necessarily groundbreaking with regards to style, the car looks handsome, sophisticated, and upscale. Size wise, its towards the smaller end of the mid-size segment. Kizashi is available in four trim levels: S, SE, GTS, and SLS. Standard interior features include power everything, sport seats, push-button start with keyless entry, steering wheel audio controls, dual climate control, and iPod connectivity. All Kizashi interiors look great, with the SLS's two-tone leather interior (pictured here) being a standout with a very upscale look. Options include 10 speaker, 425 watt Rockford Fosgate stereo, Bluetooth connectivity with streaming iPod ability, and Home Link universal garage door opener, windshield wiper rain sensor, and rear parking sensors, among other things. 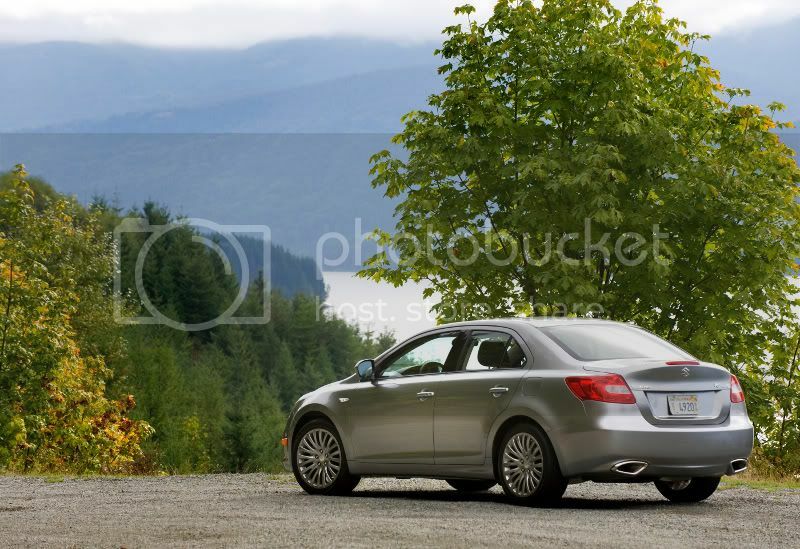 Mechanically speaking, Kizashi is available in either front-wheel drive (FWD) or all-wheel drive (AWD) with a 2.4-liter four-cylinder engine making 185 horsepower. Front drivers are available with either a six-speed manual transmission or a continuously variable transmission (CVT). All-wheel drive models are available only with the CVT. FWD fuel economy will be as high as 23 city and 31 highway; AWD as high as 23 city and 30 highway. Other notable features include standard four-wheel disc brakes with ABS, Electronic Stability Program (ESP), a four-wheel independent suspension, and distinctive dual-exit exhaust outlets. Wheel and tire combos range from 16"–18". All of the cars in these photos wear the 18s. My first session behind the wheel had me piloting an AWD Kizashi through a wet slalom course. The combination of AWD, traction control, and stability systems performed seamlessly, offering excellent grip on the wet pavement. 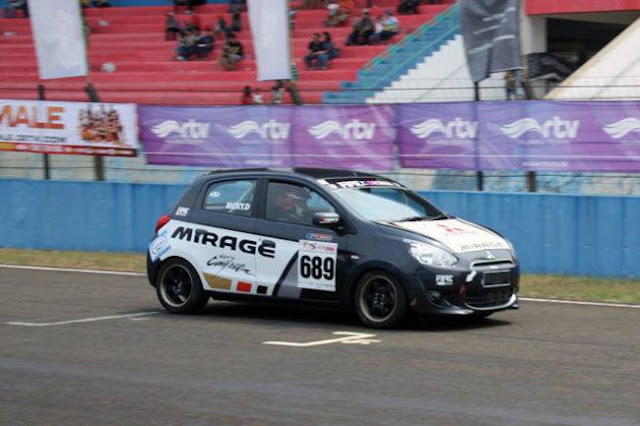 The car remained composed during cornering, and didn't make any unexpected moves. Driven back-to-back against an AWD 2010 Subaru Legacy and an AWD Audi A4, the Suzuki proved itself a worthy competitor. I also rode along with a Pro Drive instructor as we did a high-speed avoidance maneuver in a FWD CVT Kizashi, a new Acura TSX, and a new Mazda6. When thrown into an emergency situation, the Suzuki's reflexes, aided by its traction and stability systems, were impressive. Suzuki prides itself on the fact its traction/stability control systems work well and are as unobtrusive as possible to the driving experience, something enthusiasts will appreciate. Next, I got to drive some laps on the racetrack in a Kizashi GTS with the manual transmission, and the car felt very athletic; surely this is sportiest version of the lineup. Even without AWD, the grip from the optional 235/45/18 tires was very good, and the suspension was firm enough to be entertaining, but soft enough to be comfortable. 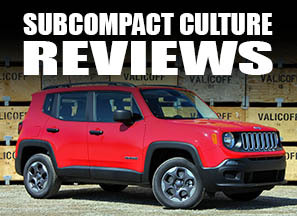 The 185 horsepower engine makes good use of its powerband, and never felt anemic. Finally, I took another six-speed manual Kizashi through a dry set of S-turns, showcasing the car's quick steering, nimble handling, and strong grip. When driven back to back against the Volkswagen CC and Nissan Altima, the Kizashi felt the most nimble and sporting of the group. Through all three tests, it was apparent that Suzuki kept the enthusiast in mind when engineering the car. The FWD base model Kizashi should start under $20,000, and well-equipped AWD models should be available between $22,000–$24,000. At these prices, Suzuki should be able to undercut many of its competitors, both FWD and AWD. But there are a ton of cars in this segment including Honda Accord, Toyota Camry, Nissan Altima, Mazda6, Volkswagen Passat, Ford Fusion, Chevrolet Malibu, and Portland favorite, Subaru Legacy. Suzuki will need to step up its marketing efforts to get the word out. But, if it can get people into its showrooms and behind the wheel, buyers will be rewarded with an affordable, sporty, all-weather sports sedan backed by with Suzuki's seven year, 100,000 powertrain warranty. Great write-up! I'm really excited for a chance to drive one of these! 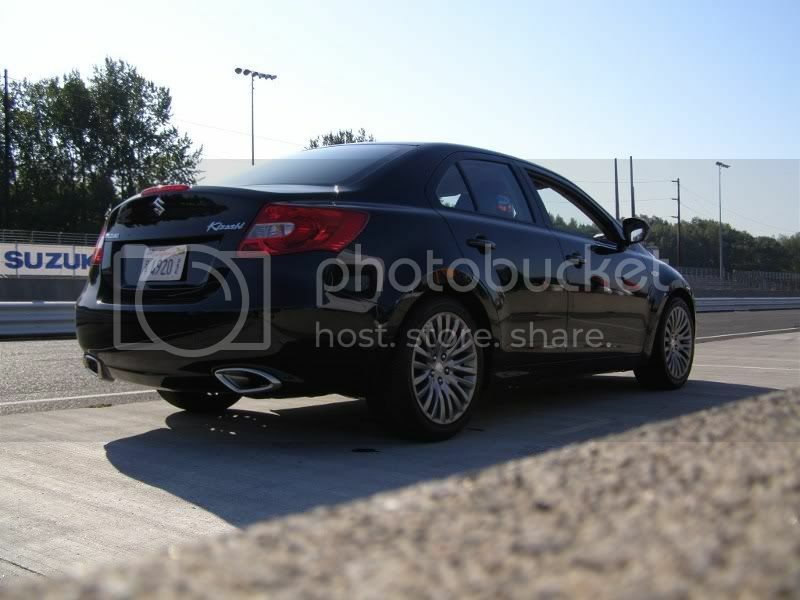 This just might be my next car. I would like it better if it was a hatchback! Good for Suzuki. The reviews, so far, seem quite favorable. Nice looking car. Great reviews so far, but I don't know if this vehicle will succeed. Suzuki has a poor reputation here in the US and the current dealer network is pathetic. They are going to have to market the hell out of this, with GOOD commercials and none of the junk they have had before. I agree: Marketing this vehicle will be the key to its success. I look forward to driving one of these. So the four doesn't feel anemic, even in the fairly heavy AWD? I'd like to provide some quick reliability stats on the Kizashi, but this will depend on how well they sell and (related) how soon enough owners sign up. I really don't give a rat's patooie if any body buy's a kizashi, just as long as i can get my mits on one, who wants another cookie cutter japanese car when you can have an exotic straight off the boat from hammatsu.